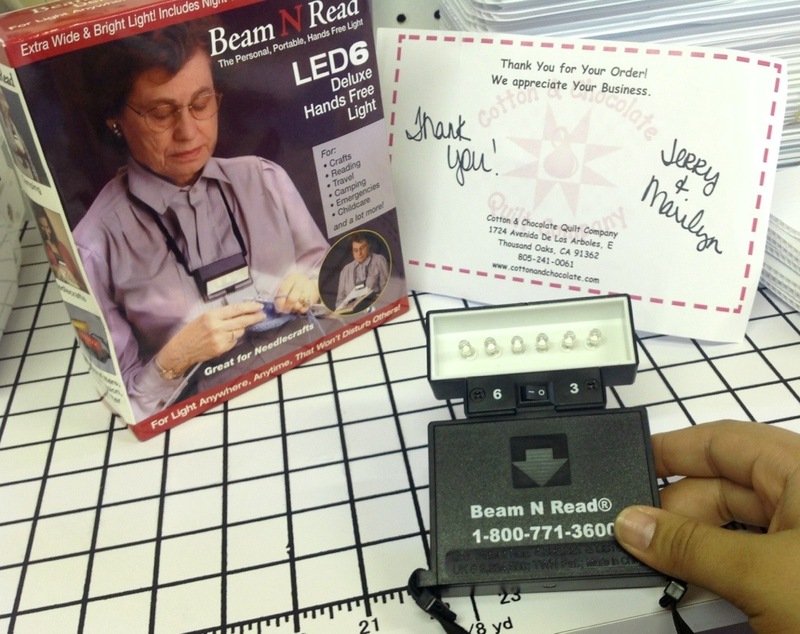 Beam N’ Read Handsfree light from Cotton & Chocolate Quilt Co. 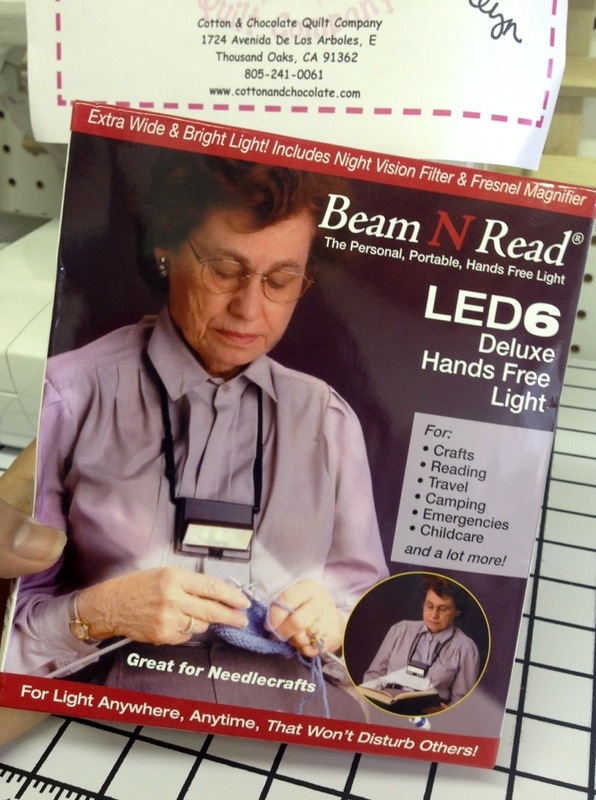 I met Jerry, and his lovely wife Marilyn, at the quilt festival and discovered this handsfree light. 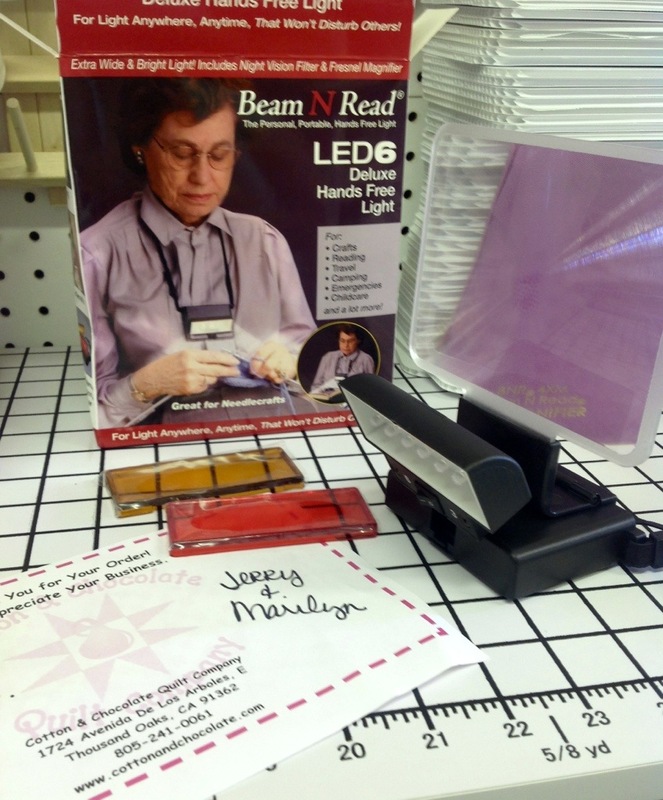 Their shop,Cotton & Chocolate Quilt Company , carries many adorable patterns, kits and this Beam N’ Read light! They are so kind! 🙂 I also purchased their sew simple pineapple book, I’ll post about that later. 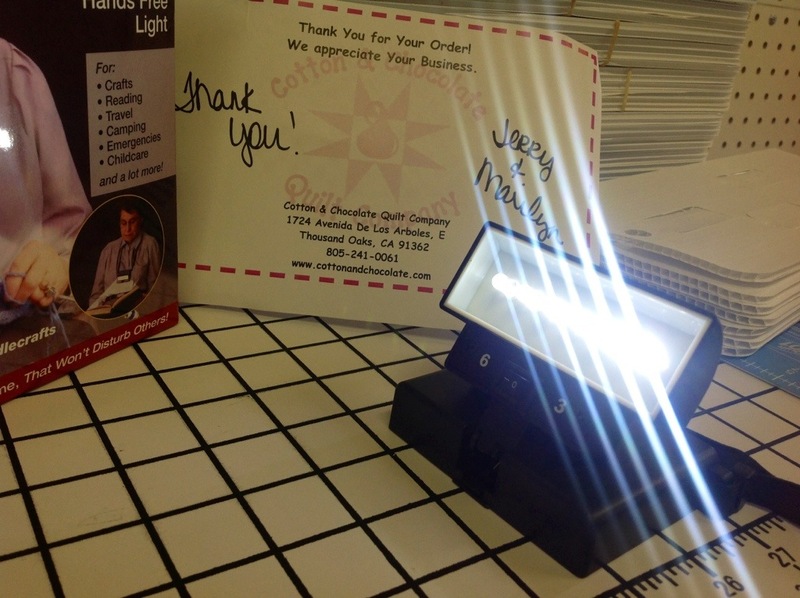 I took pictures of the box all around, it’s easier than me poorly explaining how great this light is! 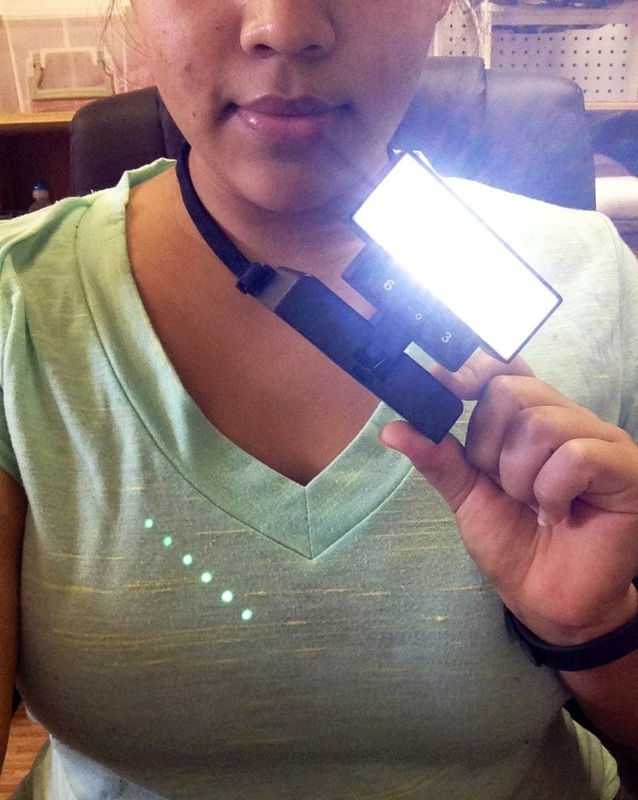 The light comes with two clip on filters, a red and orange one, to be able to adjust the light from bright to night to soft. 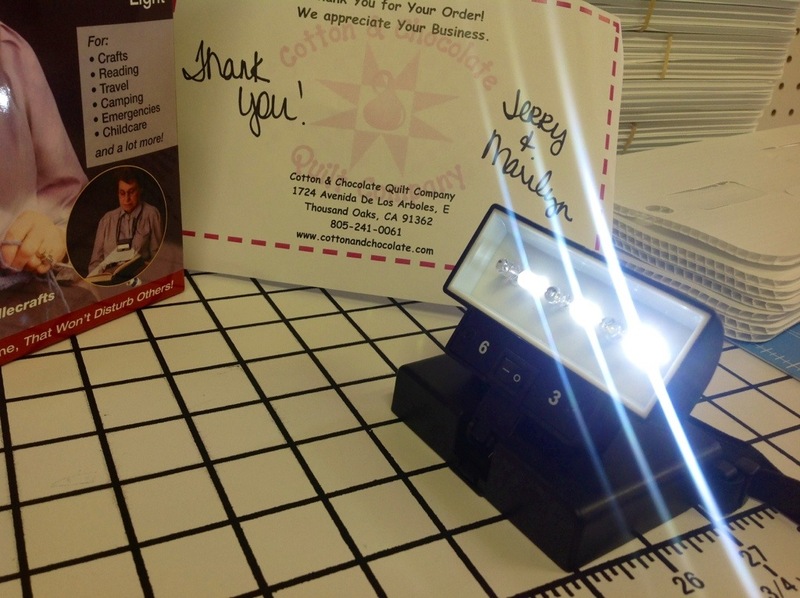 It also comes with a 4×5 inch magnifier that can easily clip on the top of the light. 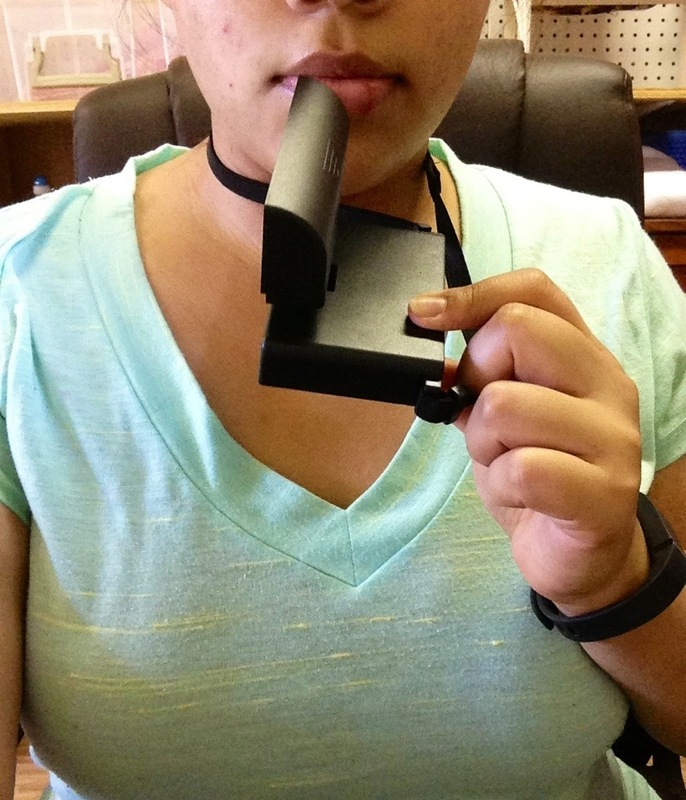 It runs on 4 AA batteries but you can purchase the AC adapter for AC power. When laid out straight and “closed” it is off, bend it up “opening” the light and it turns on. 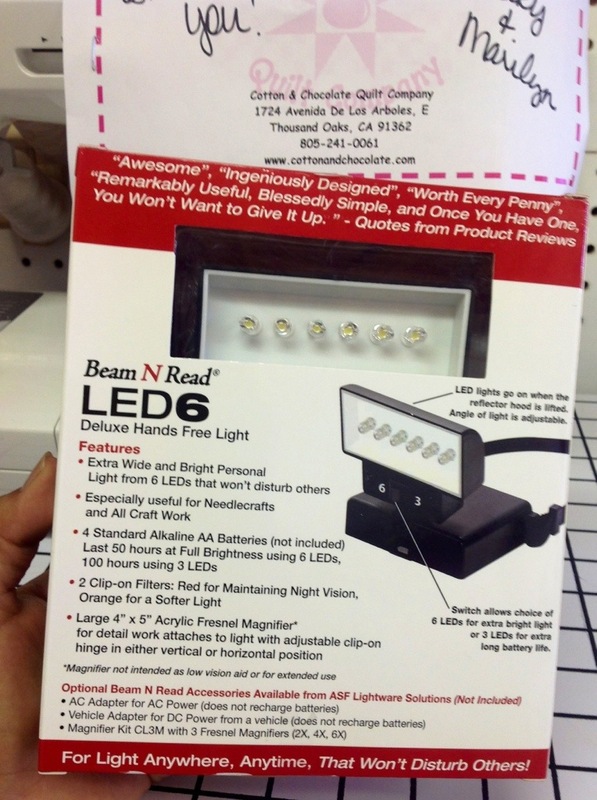 It has 6 LEDs, and the option to light 3 or 6 LEDs. Thanks for reading! 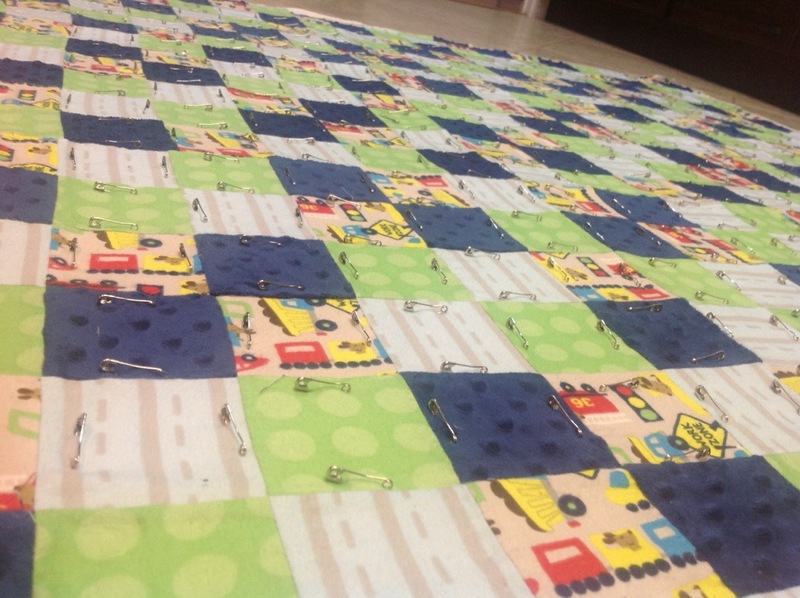 Check in later for a tutorial on how to pin/ baste a baby quilt! Nice write-up Diana. Love the cat in the background. 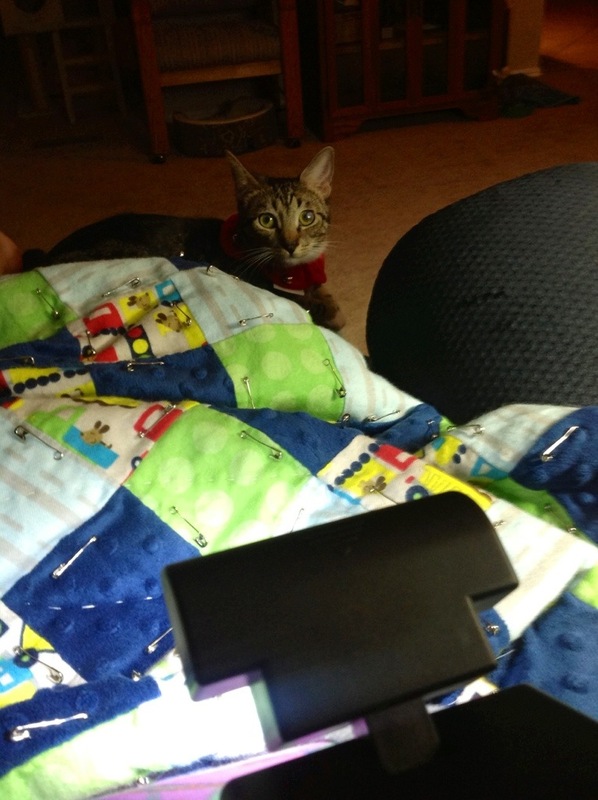 As most quilters with cats already know, cats love quilts! 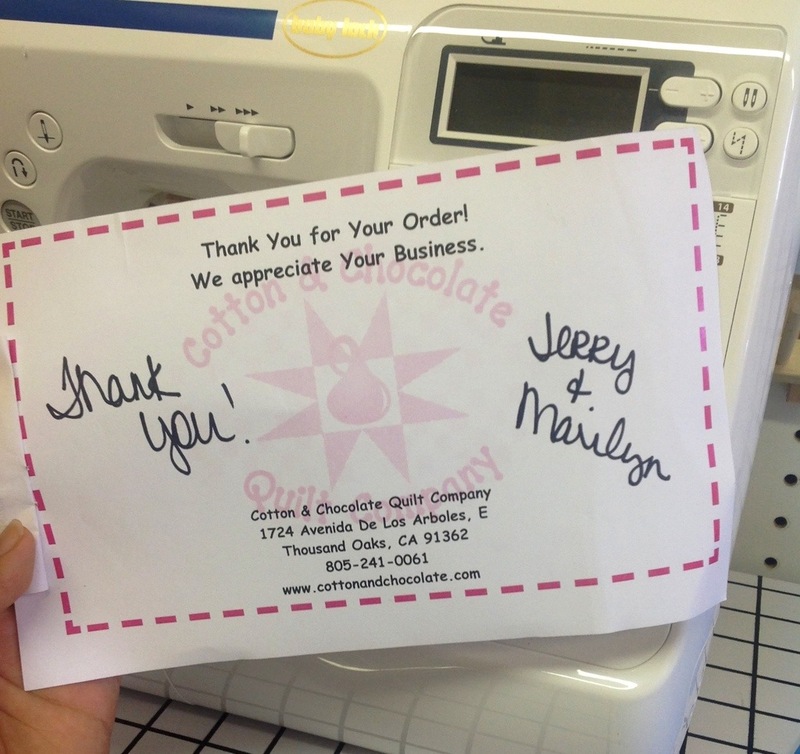 Jerry (from Cotton & Chocolate). Thank you Jerry! 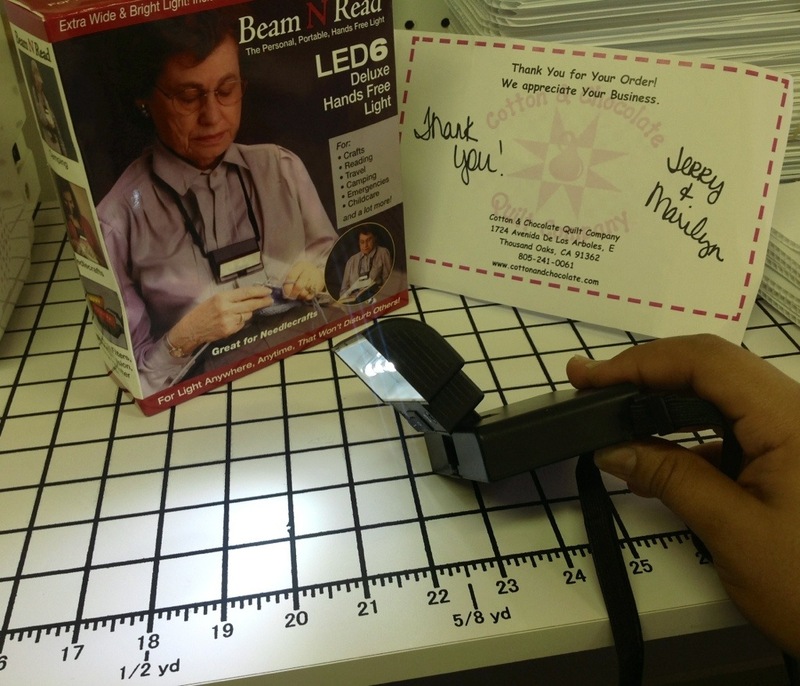 🙂 I love my beam n read light! 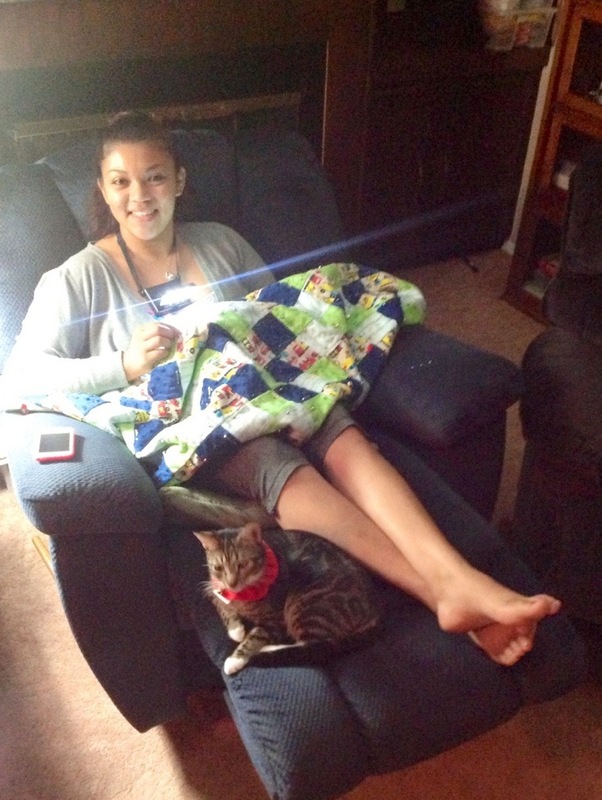 And most definitely, my cats just cannot stay away from quilts, wether they’re completed or not! Silly kitties! 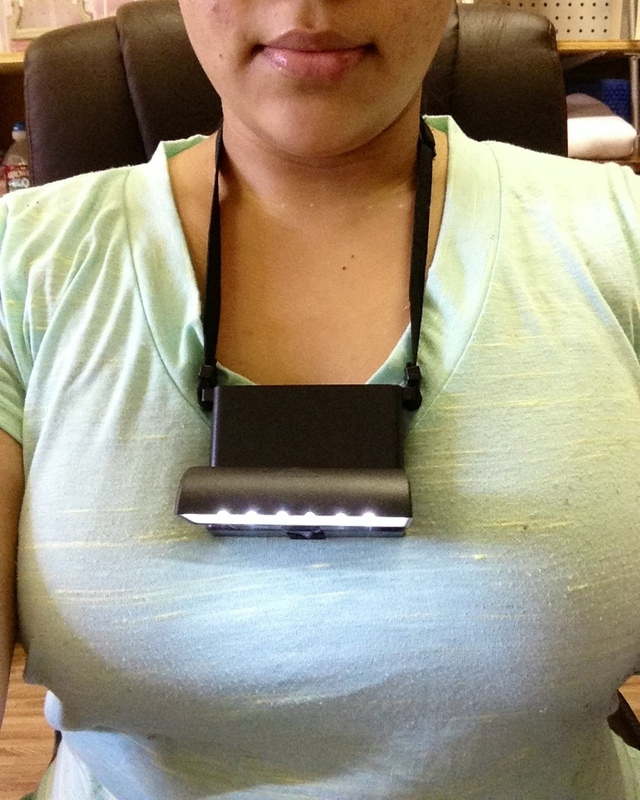 What a great light Diana. Thanks for sharing. Thank you very much for reading ! 🙂 I really appreciate it! Previous Previous post: My new and IMPROVED Crafty Room! :) Peg-walls and all!